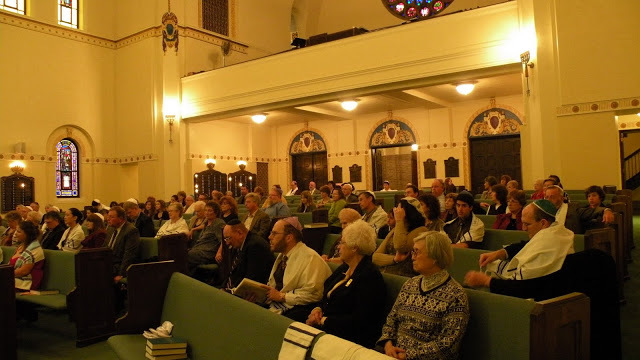 Our synagogue is a blend of Reform and Conservative Jewish practices and traditions. We welcome everyone and enjoy the diversity Judaism provides in our community! We are certain you will find a good place to fit in here! Our Weekly services are typically Friday, Saturday and Sunday. Friday nights we hold Reform services for Shabbat. Saturday morning Shabbat services are more Conservative and involve more in-depth Hebrew. We will read from the Torah with a minyan present. Both men and women are counted towards our minyan. We call everyone up to the Torah for blessings as well. This is held in our Chapel which is smaller and more intimate. We discuss Torah in a comfortable and casual way. Sunday mornings are our weekday services. Both men and women are welcome to participate! Our services incorporate musical instruments and our B'nai Sholom Choir guides our songs and prayers. We serve snacks and treats after services in our social hall where we catch up and enjoy our time together. together on the following day. When the festival falls during the week, we have the evening festival service at 7:00 pm and the morning service 11:00am – 1:00pm. special arrangements. See the B’nai Sholom calendar for information. Selichot Service (Pentitential Prayers in preparation for the High Holy Days) – Saturday night before Rosh Hashanah. 8:30 Dessert; 9:00 Service. We have a visiting Cantorial Soloist for our Rosh Hashanah and Yom Kippur Services, and we dress more formally for these services. 3:00 pm Children’s Service led by the Youth Group. Immediately followed by Tashlich (casting away). We walk to Ritter Park with the rabbi and cast our sins, in the form of bread crumbs, into the creek. Friday evening and Saturday morning services are at the same times as regular Shabbat services. We walk around the cemetery with the rabbi, stopping to tell stories and say Kaddish at the headstones of our dear ones.